John Bonifaz, the Massachusetts Civil Righs Lawyer who has been a leader in the fight to right the wrongs commmitted in Ohio in 2004, is running for Secretary of State of Massachusetts. Imagine a Secretary of State who is actually for voting rights? The prospect is unimaginable in the era of Katherine Harris and Kenneth Blackwell. Democratic Candidate for Secretary of State of Massachusetts. free and fair elections for the country. "John has been at the forefront in the ongoing struggle for our democracy here at home. I can think of no better candidate for Secretary of State than John Bonifaz. He will make Massachusetts and the country proud. "- Congressman Jesse Jackson, Jr.
"John Bonifaz has been a remarkable asset to me and to the nationwide movement to hold the Bush Administrationaccountable for its abuses of power. Massachusetts deserves a strong, proven leader like John Bonifaz. Our country needs to elect more principled progressive candidates like John Bonifaz." - Congressman John Conyers, Jr. The right to vote, as well as the principle of “one person, one vote,” are cornerstones of our democracy. The anti-slavery, women’s suffrage, and civil rights movements as well as the expansion of voting to young people are all part of the history of electoral reform in this country. Equally fundamental is the assurance that each voter knows that her or his vote counts and is counted as intended. At this time in our history, many have lost confidence in our voting system. Currently there is no government agency that regulates the voting machine industry in the United States. Roughly 80% of votes in the 2004 presidential election were cast and counted on machines manufactured by two private companies, Diebold and ES&S (Election Systems & Software, Inc.), both controlled by registered Republicans. There are two principal types of machines now in use: (1) touch-screens (DRE – Direct Response Electronic), on which no audit or recount is possible because they have no paper trail and (2) optical scans, which use paper ballots for the vote but are counted by central tabulators (particularly susceptible to fraud). Although several bills currently pending in the U.S. House and Senate, introduced by both Republicans and Democrats, propose changes to electronic voting machines, as do HAVA, the EAC and the Carter-Baker Commission, none consider hand marked, hand counted paper ballots (HCPB) as a possible solution. Most of the proposed legislation advocates for what is variously called a voter verified paper audit trail (VVPAT), a voter verified paper trail (VVPT) or a voter verified paper ballot (VVPB). A discussion of the nuances between and among these systems is beyond the scope of this article, but all share a potential weakness – namely, there is no way to prevent hacking of electronic voting machines later in the process, whether a voter receives a record of how she or he voted and/or whether there is a paper trail in the machine. Mandated random audits of the vote raise the question of whether the audit will really be random and bring back flashes of Florida in 2000 and a long drawn out struggle. Will the Supreme Court again put a non-elected person in office as president of the United States? 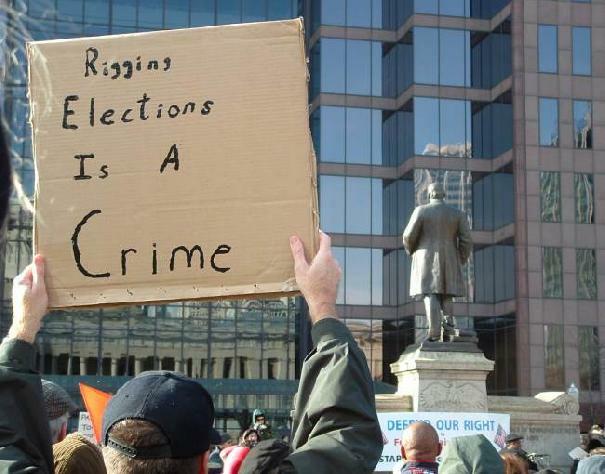 After the 2004 presidential election, Cuyahoga County election workers secretly skirted rules designed to make sure all votes were counted correctly, a special prosecutor charges. While there is no evidence of vote fraud, the prosecutor said their efforts were aimed at avoiding an expensive - and very public - hand recount of all votes cast. Three top county elections officials have been indicted, and Erie County Prosecutor Kevin Baxter says more indictments are possible. Michael Vu, executive director of the Cuyahoga County elections board, said workers followed procedures that had been in place for 23 years. He said board employees had no objection to doing an exhaustive hand count if needed, meaning they had no motive to break the law. Internet bloggers have cried foul since 2004 about election results in Ohio, one of the key states in deciding the election. They have been tracking Baxter's investigation with online posts about the indictments. Baxter's prosecution centers on Ohio's safeguards for ensuring that every vote is counted. Baxter charges that Cuyahoga election workers - mindful of the monthlong Florida recount in 2000 - not only ignored the safeguards but worked to defeat them during Ohio's 2004 recount. Citizens Alliance for Secure Elections (CASE Ohio) is currently seeking volunteers to participate in our "Adopt a County Board of Elections" program. The program is designed to provide oversight and input into BOE decisions in the individual counties. Participants will be given specific tasks. CASE believes that the 2006 election will be fraught with problems due to the new equipment. This Week's Quote: "Some of you are going to hate my guts on Election Day," Diebold Sales Representative Dana LaTour to Utah election officials. When asked what she meant, another Diebold Representative explained "We're going to have problems on Election Day, and we're just going to have to work through them". CASE will provide direction, including template letters and templates for verbal communication, at regular intervals preceding the election. CASE experts will serve as a resource to answer your questions. We will communicate with BOE’s on a regular basis, with limited requests. We will address the following issues over time along with other issues that may arise. Contact BOE personnel in order to establish positive communication and a productive personal relationship. Request specific procedural documents in writing or verbally. Compare your adopted county security procedures with other counties. Participate as a poll monitor in a precinct in your county if possible and work with other poll monitors in your county. Lobby BOE's to use strict physical security standards based on best practices in the State, and we will monitor to see that these procedures are followed on Election Day. Lobby BOE's to voluntarily compare the results to the Voter Verified Paper Audit Trail (VVPAT) in a statistically random manner. Lobby BOE's to review the internal transaction audit log, and make the data public post election. Make every effort to capture precinct level election results, before the results are consolidated via central tabulator. Keep BOE’s informed as to current news events regarding electronic security. Participants may choose one county only (county of residence) or can choose multiple counties. CASE is able to send group emails to each BOE, but we believe this is a poor substitute for a personal relationship, personal follow up, and a thorough understanding of our concerns. We hope to build a network of activists with "with boots on the ground" during the 2006 congressional elections and on into the future. Please respond to Pete Johnson at pjohnso6@insight.rr.com if you are interested in participating.